The Armenian leadership’s attempts to demonstrate the Armenia-Azerbaijan Nagorno-Karabakh conflict as a conflict over the protection of human rights and assert that Azerbaijan demands territories without the Armenian population are completely unfounded and nonsense, deputy head of the foreign relations department of the Azerbaijani Presidential Administration Hikmet Hajiyev told reporters on Oct. 12. 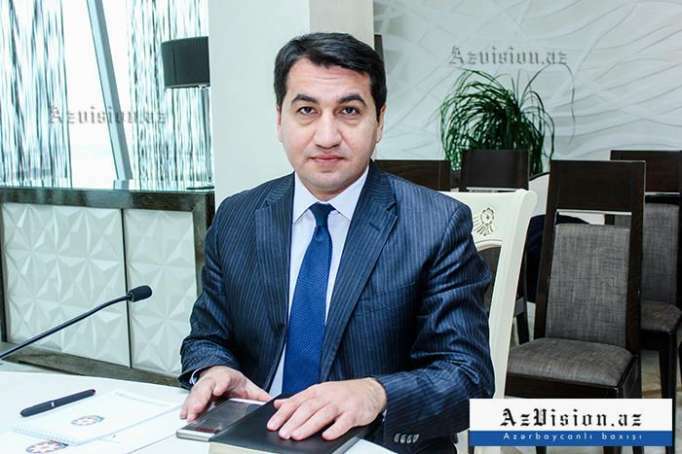 Hajiyev stressed that Armenia, contrary to the UN Charter, by using force, occupied the territories of Azerbaijan - Nagorno-Karabakh region and seven adjacent districts and created a separatist regime on those territories. "Armenia has committed numerous war crimes against Azerbaijan, crimes against humanity, by grossly violating the international humanitarian law,” he said. “Having carried out bloody ethnic cleansing against the Azerbaijani community of the Nagorno-Karabakh occupied by Armenia and the residents of the surrounding areas, the country openly demonstrates that it aims at the illegal annexation of these territories without the local Azerbaijani population,” Hajiyev added. He also said that Armenia’s talks on human rights when it grossly violates the most fundamental rights of more than a million Azerbaijani internally displaced people and refugees goes beyond all political, legal and moral frameworks. “Fundamental human rights and freedoms are universal and must be applied on an equal basis without discrimination,” he said. “As fixed in the Vienna Declaration and Programme of Action (1993), all human rights are universal, inseparable, interdependent and interrelated."